Figure 1: Average articulation rate and pitch height over 72 pieces. Lines show measure-by-measure averages across all pieces in this corpus of literature by two great composers. Major keys are in red, while minor keys are in blue. Error bars are 1-standard error from the mean. Music shares many important parallels with speech, including the emotional communication. Happiness is conveyed in both domains through an increased rate of articulation (i.e. faster speech rate), and increase in mean fundamental frequency (i.e. higher pitch). Although databases of speech tokens offer ample opportunities to explore the the natural communication of emotion in language, parallel study of natural music has proven challenging. To contribute to this topic we investigated pitch and timing in frequently performed literature by Bach and Chopin. This allowed exploration of whether major key (nominally considered to be “happy”) pieces exhibited higher pitch heights and faster timings than minor key pieces (nominally considered “sad”). Our analysis explored three different 24- Prelude sets: a) Preludes from J.S. Bach’s Well-Tempered Clavier, (Book 1), b) Fugues from the same Well-Tempered Clavier, and c) F. Chopin’s Preludes op. 28. In order to ensure the tonal areas of each composition stayed in their stated keys, we confined our analysis to the first eight complete measures (i.e. excluding pick-ups) from each of the 72 pieces. This approach yielded 576 data points for each of the acoustic cues (pitch height, articulation rate) of interest. We found that the average articulation rate for the major-key pieces was 28 percent higher than the minor-key pieces (Major=5.86, minor=4.56). Additionally, major-key pieces were on average a major second higher than the minor-key pieces. As shown in Figure 1, these effects were consistent across all eight measures. This builds upon previous research by documenting a clear parallel in the use of acoustic cues to communicate happiness and sadness in speech and music, informing current discussions regarding similarities in the structure and evolution origin of these two domains of communication. For more in depth analyses see our paper in Frontiers in Psychology (Cognition), which was rated one of the most impactful articles of the year (top 1%) in their Spotlight 2015. 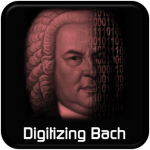 Explore this topic further and see the data for yourself using our Digitizing Bach applet. This study exploring how modality affects pitches and rhythms grew from our earlier study of how instrument construction affects modality. When writing for xylophone, composers are constrained to using relatively high pitches and fast timings, as xylophone bars lack the sustain needed for more lyrical passages. In contrast, when writing for the marimba composers have a wide range of pitches and timings available. An analysis of commonly performed repertoire for the marimba (affording a wide range of pitches and rhythms) and xylophone revealed that approximately 60% of tonal marimba pieces in this sample used major keys. In contrast when writing for the xylophone’s restricted acoustic palate, composers shied away from minor keys, using them in only 6% of the surveyed repertoire. This bias against using of minor keys on the marimba is consistent with the idea that composers shy away from attempting to write sad music on instruments ill-suited for performing low, slow melodies. Figure 2: We found few examples of minor key pieces for the xylophone, in contrast to the marimba.